When I was pregnant, I might have been just a teensy bit hepped up. I saw the movie shortly before she was born, and for some reason it really ticked me off. No daughter of mine was going to give up her kingdom for a boy! She was going to take kick-boxing, not ballet, wear jeans instead of dresses, and never, ever, trade in her fins for feet just for some dude with nice hair. Ahem. Has anyone seen my daughter? I’m thrilled, of course, that she loves ballet, that she’s graceful and delicate and beautiful. I’m impressed by her very girly sense of style. But the moral of the story is, watch what you say in the delivery room when you are on drugs, because it will come back to bite you. So, when she brings up Ariel, I counter with Nancy Drew, with Laura Ingalls, with Kitty Jones, with any one of a hundred of fictional heroines who can help her find her way along the path to a confident adulthood, a path that’s slippery enough on its own without some little mermaid adding to it. I’m all about the strong heroines. When she’s older, I can’t wait to introduce her to Harriet Vane, to Jane Whitfield, to Elizabeth Bennet and Claire Beauchamp and perhaps even my own strong Evenfall heroine, Gert Murphy. Of course, she’s already met my very favorite, because I have a life-sized cut out of her in my office. Don’t forget, post your favorite heroine in the comments before Thursday for a chance to win an autographed copy of The Heroine’s Bookshelf! Uhm. Wow. Yes, you are reading WAY too into it. Don’t most people, “…alter their bodies for love?” Like, for example, the majority of the people in the gym? Yes, some do it for their health, but don’t they try to alter their bodies to look better as well? Have you never complained you were overweight and looked fat? Why does it matter? Why get a decent haircut and wear a nice dress? Why wear heels? Why wear perfume? Why? 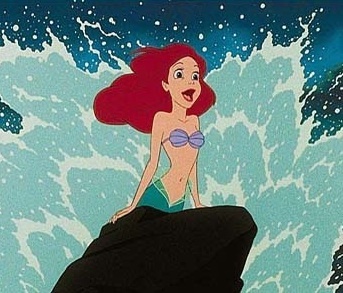 And…and…Ariel willingly chose her path, did she not? Was she miserable after “she altered herself”? She ultimately ended up happy, no? I mean, so happy that it was fairytale ending, correct? Tell me again what was so bad about that? I think the difference, for me at least, is that she essentially mutilates the part that makes her unique, the very essence of herself. That’s different from a new haircut or perfume. And I don’t think that’s the best message to send to little girls — that you need to fundamentally change who you are to be happy. What about men or women who “mutilate” themselves by losing 100lbs? Their essence was obesity. Then they change and are now happier. I think what you don’t realize is the Ariel WASN’T happy in the movie, which is why she was willing to let the ocean go. I recall her being bored and fascinated with the “land stuff”. So what’s better? 1) To NOT “fundamentally change” and NOT be happy, or 2) to “fundamentally change” TO be happy? There is no logic in remaining in an unhappy state when you have the option to be otherwise, no? It would actually be pretty stupid of her to to do so. I am wondering if it were a merMAN, who gave up his kindom and fins, if it would be ok with you. I don’t see that movie being about altering/mutilating one’s body. I see it about love and sacrifice and that’s usually what people do when the really want to be with someone badly enough. They sacrifice their location, career, $, etc. for people whom they love enough. I would take a bullet for my loved ones, thus “mutilating” my body and “fundamentally changing” who I am. By your logic, this is a bad thing, correct? I’m not sure your analogy is apt — losing weight isn’t the same as mutilating yourself. What Ariel does is more akin to cutting off a limb. And taking a bullet for your family isn’t the same thing as changing who you fundamentally are in the hopes that someone will find you attractive. I dare say, giving up everything for love is only a bad thing if it ends badly. In the movie’s case, it ended well so I ain’t seein’ how it was a bad thing at all. Okay I will weigh in here not because I give a whit whether we wave fins or feet (sorry couldn’t resist the alliteration…), but because I do love a feisty debate! Not flaming here, just spewing my own special brand of nonsense. Liz, your interpretation of The Little Mermaid is interesting, and obviously fueled by feminism. For the record, I don’t think there are very many little girls out there who will or have interpreted The Little Mermaid story this way. As a child, I remember pleading with my mom to change my name to Snow White, because I read this story over and over and just loved the character and wanted to be just like her—not because she came back from the dead with a kiss or because it was a handsome prince who saved her, but because she was pretty, could sing well, and had animals for friends. Feminism is sometimes flawed by a major paradox of ideology. While feminism upholds the right of women to be who they want to be, do what they want to do, etc., if they choose to be or do something that feminists deem antifeminist, they are labeled “sell outs”. It is a shame that woman who follow their hearts rather than the feminist agenda are pitied or vilified by their sisters. But what if Ariel’s personal desire was to live on land, be with the guy who makes her happy, and raise the little urchins? What if a woman’s joy comes from managing her household and raising the babies—even as she sacrifices her body for this role? Sorry for the rant. I am at work and bored with nothing to do but make this stuff up.